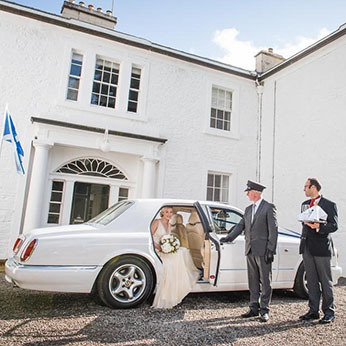 Wedding Car Hire Glasgow & West Scotland – Arrive In Style! Welcome to Rennick&apos;s Wedding Cars in Glasgow. We are a local, family run business that takes great pride in delivering an excellent wedding car hire service to all customers. 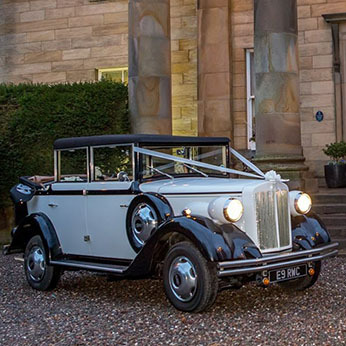 We offer a superb choice of stunning wedding vehicles including two 1930s Regent, vintage-style open tourers, three Mercedes E Class seven-seater limousines, a newly restored 1972 VW camper van, a Bentley Arnage and a Chrysler 300c. You can rest assured that we have the vehicle to suit your personal tastes and individual requirements. All wedding cars are beautifully maintained to the absolute highest of standards. At Rennick&apos;s Wedding Cars, our chauffeurs are professional, uniformed and incredibly courteous. 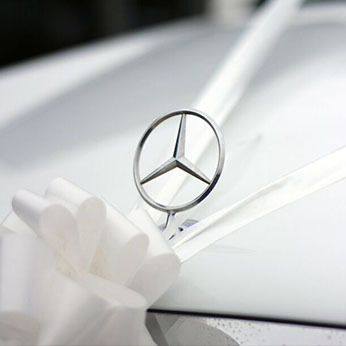 With years of valuable experience in the wedding car hire industry, we ensure all our vehicles are serviced, cleaned and are decorated with matching bows and ribbons when required. We always plan routes and confirm any proceedings, timings and special requests at least four weeks before the wedding day to make sure everything runs smoothly from start to finish. 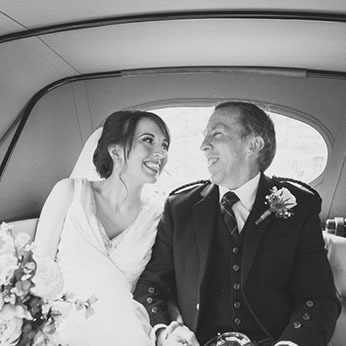 Why Choose Our Wedding Cars In Glasgow? Wide range of stunning wedding vehicles for hire. Silk ribbons and flowers provided in the colour of your choice. Advanced planning of routes and timings ahead of time. Special offers for multi-car bookings. Booster seats provided if required. Competitively priced packages, tailored to meet your needs. Flutes for champagne supplied in baskets upon request. Umbrellas are provided in each car. Reduced rates for mid-week weddings. Bookings are based on a 4-hour Wedding. This includes pick up, drop off to ceremony and then on to the venue. The wedding cars wait till after the ceremony for any photographs you may require. A £50 deposit (per car) will be required to secure a date, with the remaining balance due 4 weeks before the wedding date. Please note that all deposits are non-refundable.